However, one area which is still continues to attract significant audience figures is live TV, particularly live sporting events. For example: it was estimated that the BBC Olympics coverage was watched by 90% of UK population with a total of 51.9 million people watching at least 15 minutes of the games. For the Brazil World Cup one billion viewers watched the final and more than 750 million viewers watched the Women's World Cup held in Canada last year. With the recent coverage of the Euro 2016 football tournament, Wimbledon, and of course motor racing, the options for the consumer is growing every day. By their very nature live events offer viewers an un-paralleled experience which simply cannot be obtained elsewhere. As well as appealing to mainstream sporting fans, live events have the power to attract more niche audiences who may pay for content and in addition, advertisers who are keen to take advantage of hard-to-reach captive targets. In this way, increasing the volume and variety of live sports broadcasting could offer broadcasters potential new revenue streams. However, producing a live sports event is an expensive logistical exercise. Cameras, cables, multiple points of audio, power, air con, staff plus OB trucks need to be shipped in order to create the huge temporary infrastructure required at any live event in order to mix the live feeds and capture the exciting real-life atmosphere. One way to reduce costs is to take advantage of remote production over IP. Classically this means having less resources and kit on-site and production based back at the broadcaster's facility. By taking advantage of our MD8000 solutions and soon to be released products, high quality video and audio is converted using JPEG2000 into an MPEG-2 Transport stream. The signals whether SD, HD or 4K can be sent compressed or uncompressed at bit rates suitable for the network and quality required. The encoding process enables lower bit rates while also maintaining image quality and reducing the amount of bandwidth consumed across the network. Hitless switching is ensured through two identical output streams routed over separate paths to a single destination, where any errors on one stream are avoided by immediately switching to the other, preventing packet loss during event and production. This gives additional confidence in ensuring that the shot, try, goal, point, is not missed in any live event. Media Links' solutions are deployed globally by broadcasters, and major telco's and have been used to provide live content contribution for the Sochi Winter games and World Cup soccer, experiencing 100% uptime. 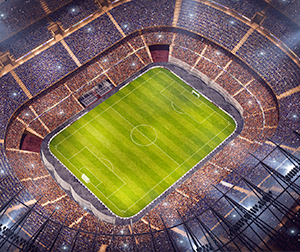 In fact, Media Links has an installed customer base of over 1000 sports venues, serving customers on six continents, providing backbone technology behind many major events around the globe. For information about our experience working with the various standards and carriers required to move content successfully over wide area networks with 100% QoS using our true IP based products and hitless switching technology and for real-life examples come and see us at IBC on booth 1.C31.